This weekend, go check out the utterly delicious Ample Hills Creamery ice cream with a brand new location in hipstery Gowanus complete with plentiful outdoor space. Born from the wildly popular Prospect Heights shop, Ample Hills also has a kiosk at Pier 5 in Brooklyn Bridge Park and a new ice cream book out, titled "Ample Hills Creamery: Secrets and Stories from Brooklyn's Favorite Ice Cream Shop," written by AHC's husband-and-wife co-owners Brian Smith and Jackie Cuscuna, together with co-author and illustrator Lauren Kaelin. 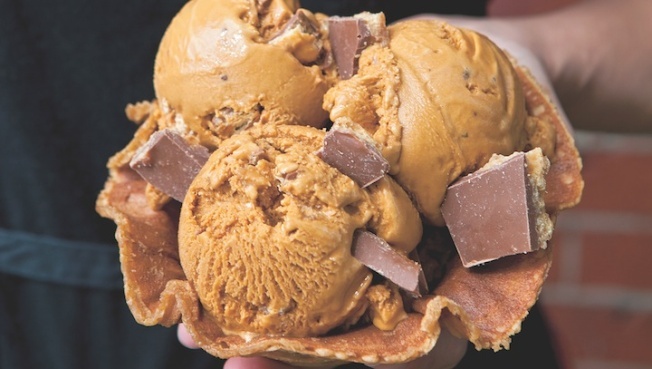 Part cookbook, part narrative, the book features recipes for Ample Hills' signature flavors like Salted Crack Caramel and The Munchies, as well as a few new ice cream creations. The Gowanus location is a huge two-story space which houses the manufacturing facility as well as a scoop shop and a multi-function space for classes, parties, and events. Delicious! For more info, visit AmpleHills.com.